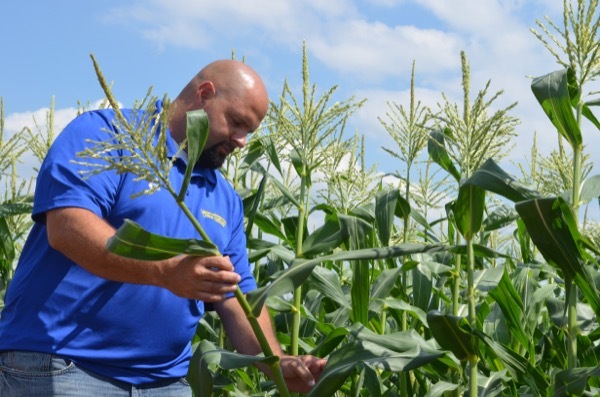 Cooperative Extension agents and researchers at the University of Delaware are taking a closer look at how brown marmorated stink bugs are causing damage to developing ears of sweet corn, the results of which could lead to better pest management strategies for growers throughout the state. The research was supported in part by the U.S. Department of Agriculture (USDA) National Institute of Food and Agriculture (NIFA) Specialty Crop Research Initiative (SCRI) Coordinated Agricultural Project, and the findings were recently published in the Journal of Economic Entomology. Bill Cissel, an integrated pest management extension agent, is a member of the research group and said that in 2011 and 2012 the researchers infested sweet corn ears with different densities of brown marmorated stink bugs — zero, one, three and five adults per ear — at three different corn growth stages: silking, blister and milk. “The objective of our research was to determine how many brown marmorated stink bugs it takes to cause damage, both quality and yield reductions, in sweet corn,” said Cissel, adding, “We also wanted to look at what influence the plant growth stage may or may not have on the amount of damage that we see and also the severity.” The researchers used replicated research plots on UD’s Newark Farm, as well as the University of Maryland’s Wye Research and Education Center, and conducted their research by placing mesh bags over developing ears of corn and then artificially infesting those bags with different densities of brown marmorated stink bugs at different plant growth stages for a period of seven days. Cissel said the results showed that brown marmorated stink bugs cause a significant amount of damage in sweet corn by piercing through the husk leaves and feeding on developing ears and kernels. The researchers determined that the greatest potential for yield loss happened when infestations occurred during earlier stages of ear development, whereas the greatest reductions in quality — damaged kernels — occurred during later stages of ear development. “We looked at feeding that occurs prior to and during pollination, before the kernels even begin to develop, and we found that brown marmorated stink bug feeding injury can result in aborted kernels. The reason we think that’s the case is because they’re actually interrupting pollination by damaging some of the silk channels,” said Cissel. The research team also found that while the bags filled with the higher densities of brown marmorated stink bugs saw the most damage to the corn, the stink bugs are capable of causing substantial economic losses due to quality reductions at densities as low as one bug per ear of corn. Cissel said that the milk stage was determined to be the most sensitive stage of corn development, with the highest number of damaged kernels observed when compared to the two earlier stages, but stressed that they did see high levels of kernel damage at all the stages. “I think of it this way: prior to pollination, they’re feeding on developing ear tissue and causing damage to the ear where kernels could ultimately be and the kernels never develop. After pollination has occurred they’re feeding on individual kernels,” said Cissel. “The milk stage seems to be the most important, but having said that, we did see some pretty high levels of kernel injury at all the growth stages that would likely result in quality reductions for sweet corn growers.” Now that the study is complete, Cissel said that the researchers are hoping to take their findings from the study and figure out the best times to apply pesticides to manage brown marmorated stink bugs in processing and fresh market sweet corn for growers in Delaware. “We plan to take the findings from that study in which we identified these different plant growth stages that are important for managing brown marmorated stink bugs in sweet corn to prevent economic losses from occurring and target those timings with insecticide applications to see how or if we can achieve control by focusing on these key timings,” said Cissel. Researchers on the project include Cissel; Charles Mason, professor in the Department of Entomology and Wildlife Ecology (ENWC); Joanne Whalen, extension specialist and state program leader for agriculture and natural resources; Judith Hough-Goldstein, professor in ENWC; and Cerruti Hooks, associate professor and extension specialist at the University of Maryland. Article by Adam Thomas Photos by Christy Mannering and courtesy of Bill Cissel This article can also be viewed on UDaily.